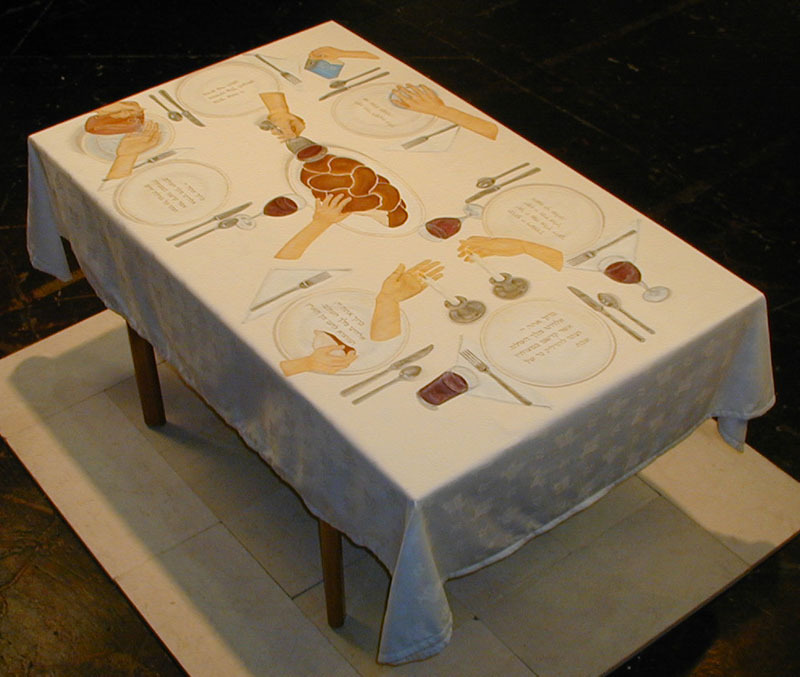 Grossman's installation, inspired by a Marc Chagall painting, reconnects contemporary Jewish culture with the Sabbath table as altar. The title comes from an old saying, "Jews do not keep the Sabbath; the Sabbath has kept the Jews," written by Asher Ginsburg (1856-1927), pen name Ahad Ha'am. Altars, as commonly considered, are not typically part of contemporary Jewish culture. In ancient Jewish history, a Tabernacle built by Moses and the children of Israel contained several components, including the Altar of Burnt Offering, the Bronze Laver, the Incense Altar, the Seven-Branched Lamp Stand, the Ark of the Covenant, and the Table for Loaves (Exodus, chapters 25-29). When the temple was destroyed in 70 A.D., Jewish homes symbolically became temples and Sabbath tables became altars. The story of the destruction of the Temple is also the story of the survival and resilience of the Jewish people. This inherent creativity and flexibility has sustained a vibrant and flourishing culture. Questioning, interpreting and making commentary are all essential to Jewish life. As an artist, Grossman interprets Jewish history and rituals using domestic objects chosen for their shape, function or symbolism. Exploring the realm of the sacred in daily life cycles, she draws questions from history, establishes a connection to the present and expresses hope for the future. The Sabbath Has Kept the Jews evokes the historical Tabernacle and the adaptation of the family Sabbath table as altar. This installation is an homage to the devoted domestic faith of generations of women who have created weekly Sabbath dinners. Welcoming the Sabbath consists of preparing the home and self by giving to charity, kindling the Sabbath lights, blessing the children, reciting the blessing over the wine, ritual washing of the hands and breaking the challah (braided bread) as the blessings are sung. To complete the Sabbath ceremony, the blessing after the meal is recited for good food, family, friends and the Sabbath itself. The Sabbath table rituals signify holy community with the Jewish people everywhere.